"Sing for Dr. King! – Vitamin L Songs for a Beloved Community," is a compilation of new selections by Jan Nigro, along with previously released Vitamin L songs about empathy, human rights, appre-ciating diversity, respectful commu-nication, each person’s ability to make a positive contribution in this world, and more. All of the songs on this CD are compatible with the teachings and ideals of Dr. Martin Luther King, Jr. Our intention is that these songs will inspire new generations of young people with Dr. King’s courage and vitally important messages – through the magic of song. Historical facts from Dr. King’s courageous, inspiring life are included in "Martin’s Heart!" "Martin is Calling" is about Dr. King and contains a call to action. The astounding bravery of the Freedom Riders’ non-violent actions taken in 1961 are remembered and honored in the song "Freedom Riders Got to Ride." "Step Up! Speak Out!" encourages all of us to take action when we witness injustice. Veteran civil rights leader Dorothy Cotton sings with Vitamin L in a rousing rendition of "This Little Light of Mine." This recording is an excellent resource that supports character education efforts at home and in school. In addition, listeners will learn some civil rights history. "Sing for Dr. King! 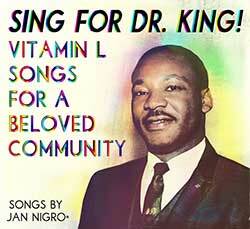 – Vitamin L Songs for a Beloved Community," celebrates Dr. King’s vision for a world in which each individual is celebrated for his or her own unique contribution to the whole human family. "Sing for Dr. King!" was produced with love to support the Martin Luther King Community Build in Ithaca, N.Y., and to support the creation of a Beloved Community to support the creation of a Beloved Community everywhere! "Dr. King’s Beloved Community is a global vision, in which all people can share in the wealth of the earth. In the Beloved Community, poverty, hunger and homelessness will not be tolerated because international standards of human decency will not allow it. Racism and all forms of discrimination, bigotry and prejudice will be replaced by an all-inclusive spirit of sisterhood and brotherhood. In the Beloved Community, international disputes will be resolved by peaceful conflict-resolution and reconciliation of adversaries, instead of military power. Love and trust will triumph over fear and hatred. Peace with justice will prevail over war and military conflict". "What an absolute precious, precious gift you are sharing with young people. Kids can be very cruel to each other; that’s why what you all are doing is so important. People need to be encouraged to do the right thing. I want to applaud you for what you are doing with your lives and through Vitamin L. It needs to be replicated all over the planet. I think if more young people had the opportunity from an early age to experience something like this, I think the world would be a very different place - I know it would be a very different place." — Yolanda King, late daughter of Dr. Martin Luther King, Jr. Lesson Plans: In 2010, some staff from the Ithaca City School District created lesson plans to support the Martin Luther King Community Build. The lesson plan document is a work in progress. A Vitamin L committee created a support document to go with the lesson plans. This identifies specific Vitamin L songs to enhance and expand specific lesson plans.